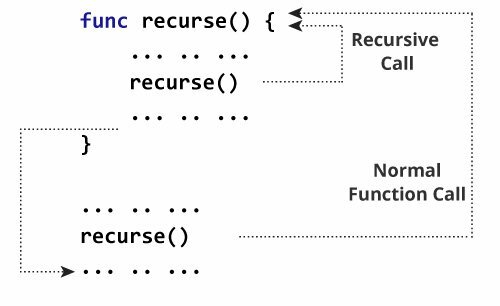 In this article, you will learn to create a recursive function; a function that calls itself. How recursion works in Swift? A function that calls itself is known as a recursive function. And, this technique is known as recursion. 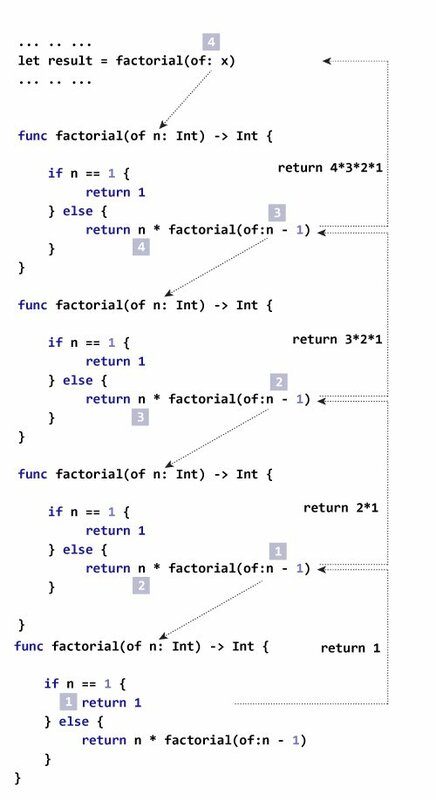 While creating a recursive function, you must create a condition so that the function does not call itself indefinitely (infinitely). The figure below shows how recursion works by calling itself over and over again. In the above flow diagram, the recursion executes infinitely. However, almost all of the times, you create a recursion that executes until some condition is met. To prevent infinite recursion, use the recursive call inside the Swift Conditional Statements e.g. if...else statement. In the above program, the statement print("Countdown:") outputs Countdown: in the console. And the statement countDownToZero(num:3) calls the function that takes a parameter Integer. The statement inside the function countDownToZero() executes and if the condition num > 0 is met, the function countDownToZero() is called again as countDownToZero(num: num - 1). If condition is not met, the function call is not done and the recursion stops. Usually recursion is used as a replacement of iteration when the solution to a problem can be find in about two steps. The first step searches a solution, if not repeat the process.